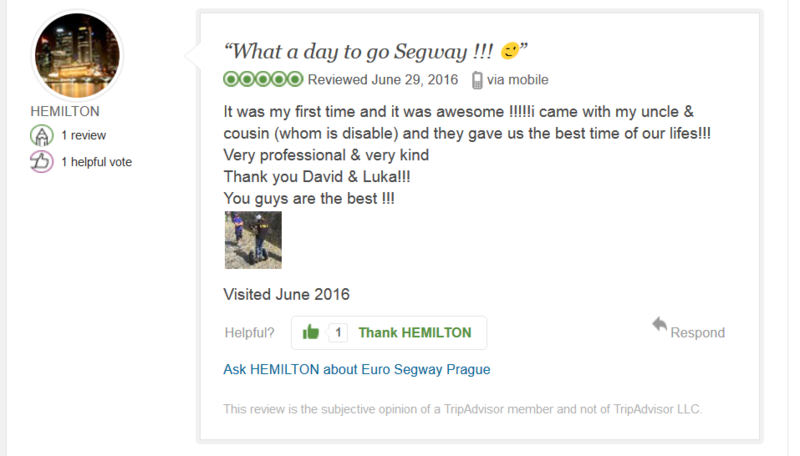 Meet up with your experienced local guide at the meeting point just near Old Town Square and start your private Prague Tour on e-Scooter. 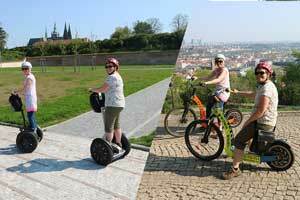 It covers all the old parts of Prague: Old Town, Jewish Quarter, Lesser Town and the Prague Castle area. 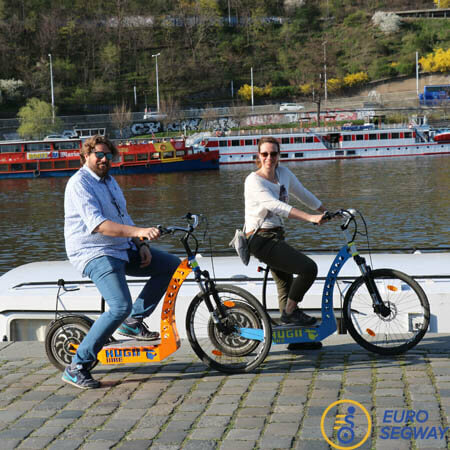 Ride along the Vltava River and climb up to Letna Hill easily riding the E-scooters to see the Metronome and be amazed by the Jewish Quarter and Lesser Town viewpoints. 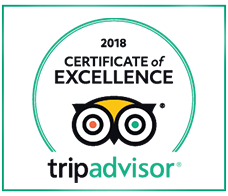 Next stop is the Prague Castle, which is the biggest castle in the world, housing the architectural mixed St. Vitus Cathedral and the South Gardens inside the Castle area. 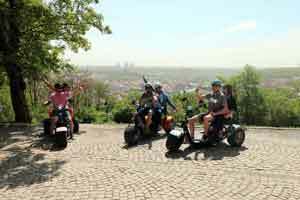 Afterwards, you will ride to Strahov Monastery where you can find beer in a 600 years old Brewery which is currently making 5 beers (3 traditional, 2seasonal) still following a secret monk recipe. 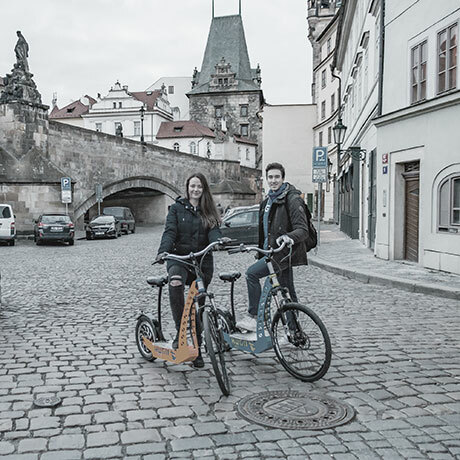 Continuing straight down to Lesser Town, you will see the Lennon Wall, the watermill, Babies sculptures, and ride under Charles Bridge to The Narrowest Street of Prague to finally reach Kafka Museum. 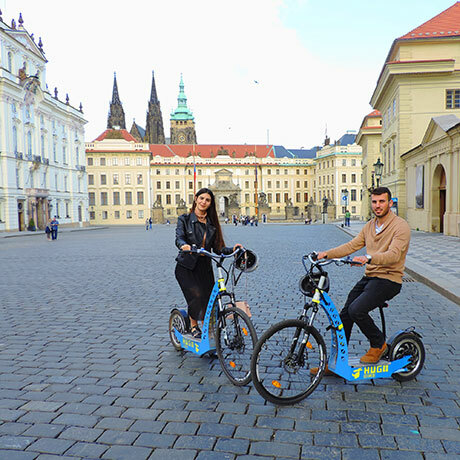 You’ll ride to the Jewish Quarter after you cross the Manes Bridge only to find the oldest synagogue in Europe and the Old Jewish Cemetery. 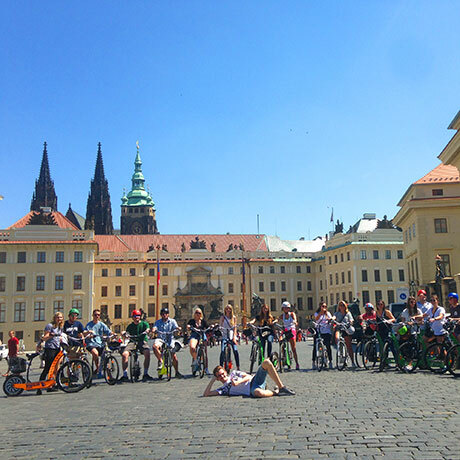 We’ll finish off riding Paris Street, the most expensive avenue of all Czech Rep. and ride back to the Old Town Square before the finish. 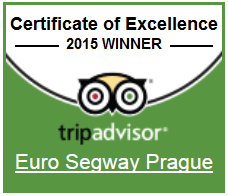 This tour is our “Classic” tour performed on Segway before the segway ban in Prague Old Town. 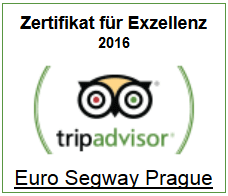 Since December 2016 we start providing tours on electric scooters in the Heart of Prague. 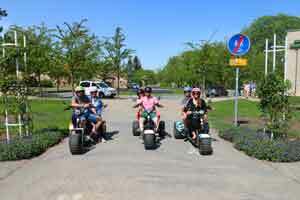 Driver’s licence is not required. 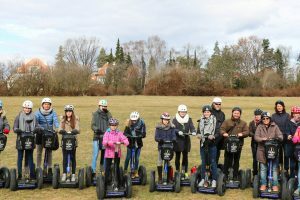 Two hours e-scooter tour is for those who want to cover most of the important landmarks and viewpoints in a short time with a personal and informative local guide. 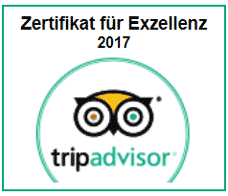 We only provide private tours therefore you can start the tour whenever you want and customize according to your wishes. 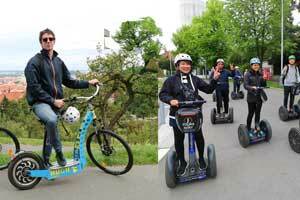 E-scooters are very easy riding and will make the tour very interesting and entertaining. 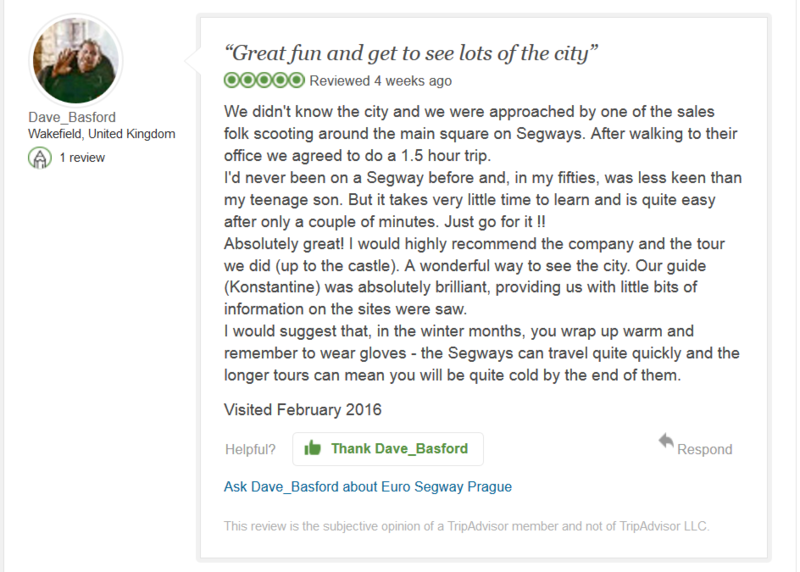 You will have a short training before you start to get used to basics. 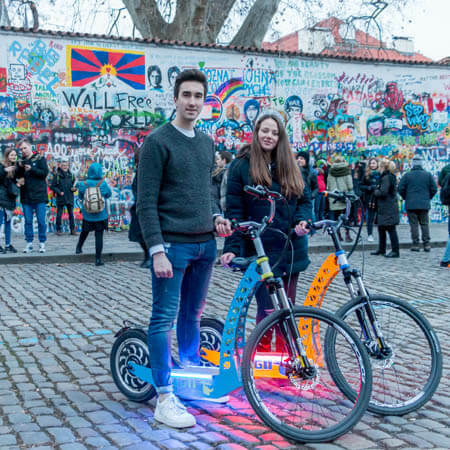 During the tour you are going to make a lot of amazing photos from several fascinating viewpoints and don’t forget to write your name or favorite quote on Lennon Wall and also make a wish while riding under Charles Bridge. 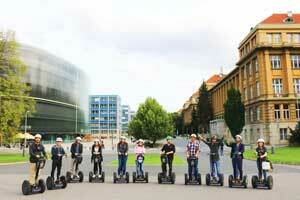 This tour is suitable for everyone, including individuals, families, even for 10-15 people groups.